Separates pedestrian traffic from motorized vehicles. Illuminates walkways during power failures. Color code different areas with specific color tapes. Easy to install and lasts. Mighty Line® patented floor tape is the most durable floor tape available. Spend more time on value added actions - producing, receiving, and shipping materials and less time on non-value added activities such as painting floor lines. Mighty Line floor tape is available in many colors and patterns in four different widths. FOB Shipping Point. Solid Colored Floor Tapes - The most popular tapes we offer. Diagonal Striped Floor Tapes - By contrasting two standard colors in a diagonal fashion, Mighty Line has constructed a floor tape that allows employees to be made aware of possible danger zones within the work area. Specialty Floor Tapes - Mighty Glow® H4RYLUMCTR and H4FY tapes are unique floor tapes developed for emergency purposes. Mighty Glow's 1/2" luminescent center line highlights exit paths during power outages. Frigid Tape is a durable, permanent cold storage floor tape. Apply to cold, clean and dry floors. Maintains adherence in -20° Fahrenheit temperatures. SORT: Leave in place only the items necessary to obtain optimal production. SET IN ORDER: Use colors of Mighty Line floor tapes and floor markers to show work flow patterns, delineate work areas, and mark proper placement of tools, inventories, and machinery. SHINE: When you keep things scrubbed, swept and sanitized, your environment can actually life morale. 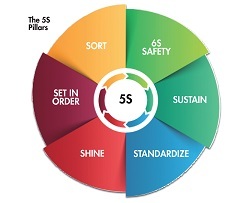 STANDARDIZES: Ensure everyone knows what they're supposed to do, how best to do it, and when to do it, until it all becomes routine. Our floor tapes, floor signs and placement markets can play a big role here. SUSTAIN: These practices are more than rules - they must become an integral part of your company culture. Over time you'll adjust signs, markings, etc. as necessary. See Related Items tab for Mighty Line Specialty Products - label protectors and tape applicators.